The Huffington Post’s Yashar Ali reported Friday that FOX News’ Eric Bolling sent numerous female co-workers lewd text messages. Bolling has since been suspended and now Yashar Ali reports law firm, Paul Weiss, will investigate the matter. 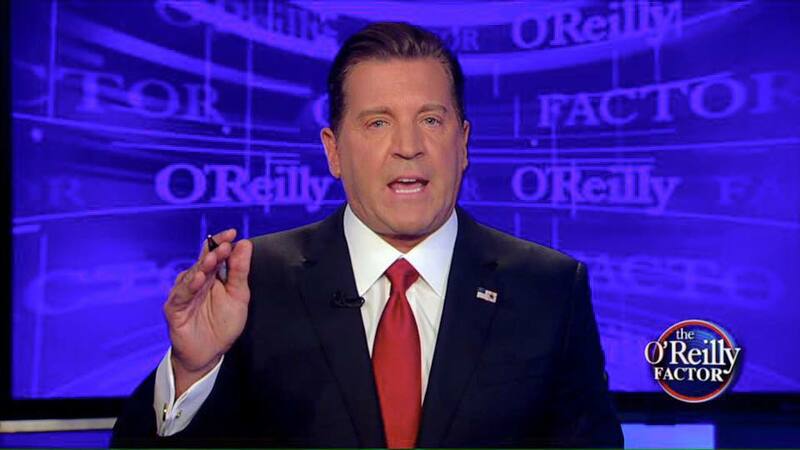 “Breaking: Per Fox News Spokesperson, Eric Bolling has been suspended. An investigation will be conducted by law firm Paul Weiss,” tweeted Ali. The firm, Paul, Weiss, has long been tied to the Clinton family, with its employees donating hundreds of thousands to its political campaigns and later cashing in on political appointments in the government. The Nov. 19 fundraiser, which is being billed as a “conversation with Hillary,” is currently being promoted on the Democratic presidential candidate’s website and costs attendees $2,700 per ticket. The event is being held as the issue of Guantanamo prison returns to the political spotlight following renewed calls by the Obama administration to shutter the prison and transfer the remaining prisoners to the United States. Paul, Weiss lawyers have played key roles in facilitating the release of inmates accused of committing acts of terrorism. Paul Weiss donated $271, 970 to Clinton’s 2016 presidential campaign! The law firm employs former DHS Head under Obama, Jeh Johnson. Jeh C. Johnson, who has stepped down as secretary of Homeland Security, is rejoining the New York law firm Paul, Weiss, Rifkind, Wharton & Garrison, where he formerly worked. He will be a partner in the firm’s litigation department. Mr. Johnson, 59, has worked intermittently at Paul, Weiss, returning four times after stints in public service, including three presidential appointments that required Senate confirmation. He led the Department of Homeland Security for three years, overseeing counterterrorism, cybersecurity, border security and immigration law administration and enforcement. The New York Times reported in 2015 that he gave legal approval for American forces to enter Pakistan to kill Osama bin Laden. Mr. Johnson served from 2009 to 2012 as general counsel of the Defense Department, where he was a primary legal architect of the military’s counterterrorism efforts under the Obama administration. In 2010, he was an author of a Defense Department report that paved the way for the repeal of the “don’t ask, don’t tell” policy by Congress. 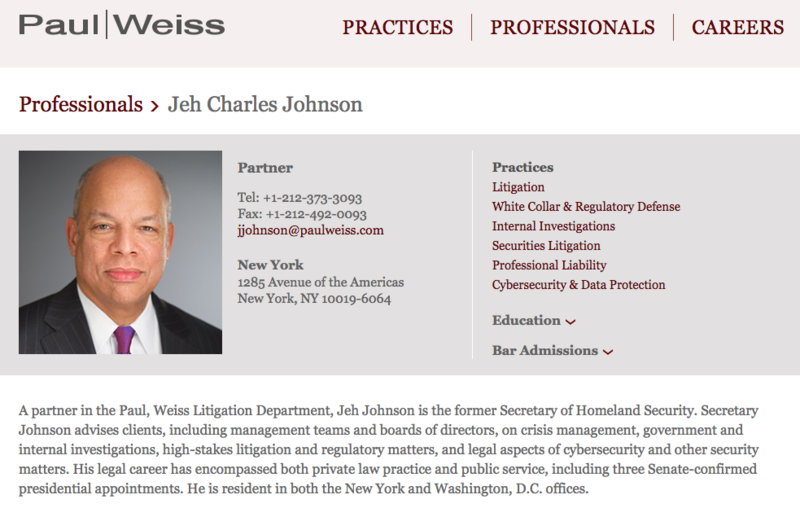 A partner in the Paul, Weiss Litigation Department, Jeh Johnson is the former Secretary of Homeland Security. Secretary Johnson advises clients, including management teams and boards of directors, on crisis management, government and internal investigations, high-stakes litigation and regulatory matters, and legal aspects of cybersecurity and other security matters. His legal career has encompassed both private law practice and public service, including three Senate-confirmed presidential appointments. He is resident in both the New York and Washington, D.C. offices.